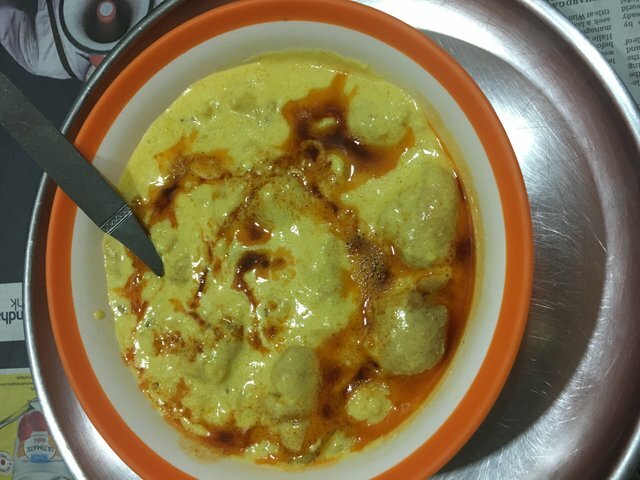 Hi, folks today I’m going to share with you a recipe of kadhi pakora, a North Indian dish in a curry form eaten with rice or Chappati (Indian bread) . This dish is very popular all over northern India. It is made from only two ingredients chick pea flour(Besan) and yogurt with few spices. It is made in various ways in different parts of India like Gujarati kadhi with a pinch of sugar or jaggery in it. Sindhi kadhi with lots of vegetables in it. Rajasthani kadhi with lentil cakes in it. Here is the recipe of this amazing dish for four people. Mix yogurt , chickpea flour , salt ,chilli powder, turmeric powder in a mixi . Heat a big pot put oil in it and add asfortieda , cumin and fungreek seeds and sauté . Now add ginger garlic paste fry for a minute then add onions and fry them until they change the colour. Now add yogurt mixture and water and keep stirring till it starts boiling. Keep it on simmer for 20to 30 minutes and prepare pakoras. Take rest of chick pea flour in a bowl and add salt , red chilli powder and onion and make a batter for pakoras ( fitters) , like pan cakes. Add pinch of soda and mix. Deep fry then in a hot oil in form of soft balls and add to the boiling kadhi. 4 . Put off the gas when kadhi thickens an serve hot with steamed rice or chappaties .